Hi, I’m David Handel, MD, retired radiologist and co-founder of iDoRecall.com. I spent over 30 years as a practicing physician and radiologist, interpreting CT scans, MRIs and PET scans of the brain. I am totally blown away by the incredible advances we’ve made, particularly during the past 15 years, in gaining a deep understanding of how the brain creates memories and how we learn. In this series, we are going to review how our brain and mind functions, enabling us to learn, create and retrieve memories. In Part I, we’ll lay the requisite groundwork you’ll need in order to understand what we know now in 2015. Feel free to skip ahead to Part II if you are already solidly grounded in the relevant basics of neuroscience. Just so we start on the same page, “What is neuroscience?” Not long ago there were many separate scientific and clinical disciplines such as neurology, cognitive psychology, neuroradiolog, and neuropathology, among others, which were independently dedicated to the study of various facets of the science of the brain and mind. They functioned in their independent fiefdoms and in some cases never interacted with each other on a professional level. Today, neuroscience is a team sport. It is a collaborative, interdisciplinary endeavor that includes specialists from many biology, medical, allied health and other disciplines. Many diverse fields such as engineering, computer science, genetics also play a role. The leading university neuroscience laboratories often bring to bear a broad range of these skill-sets on their research projects. It is this multidisciplinary and synergistic approach that is accelerating the pace of our discoveries. Let’s first perform a high-level review of basic neuroanatomy and neurophysiology so that we have a foundation for discussing the current understanding of how we learn and create a memory. The brain is the relevant part of our gross neuroanatomy — anatomy that can be seen with the naked eye — where we’ll begin our discussion. 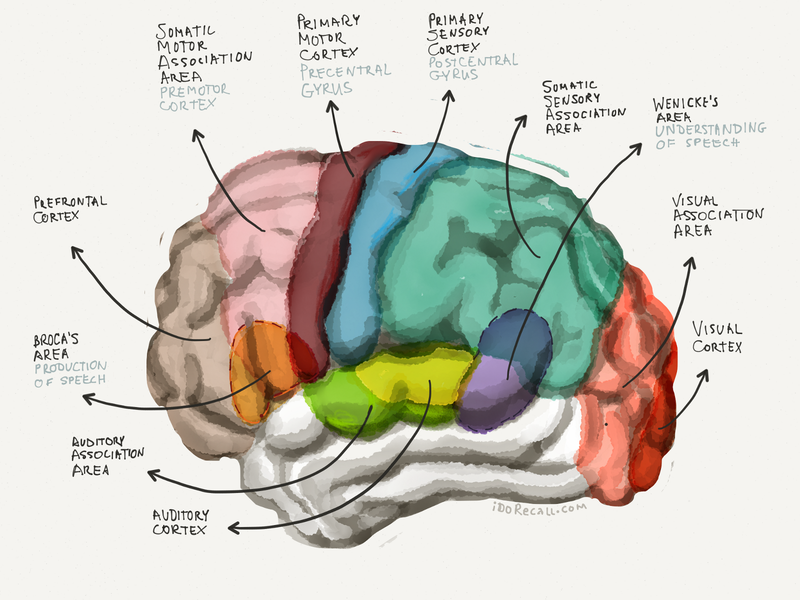 The brain is composed of several anatomic parts, including lobes and other structures, but we will focus on those parts most important to telling the story of how we learn, create and retrieve memories. I’m sure that you’re familiar with the concept that our ability to reason and think is largely seated within the gray matter of our cerebral hemispheres, or, the cerebrum. (See Figure 1) The terms can be used interchangeably. The gray matter gets its shading from the presence of a high concentration of neuron cell bodies. Despite its importance in our higher-order thinking, the gray matter outer cortex of our cerebral hemispheres is only a few millimeters deep. Amazingly, it is this thin layer of tissue that makes us human. The various lobes and regions of the cerebral hemispheres in many cases have specific functions, although there are some overlaps in functionality. When we sufferan injury to one region, such when having a stroke, other regions may assume the lost function over time. Figure 1. The cerebral hemispheres (the cerebrum). The cerebellum and brainstem are not depicted here. Behind and below the cerebral hemispheres is the cerebellum. (See Figure 2) This part of the hindbrain serves several critical functions. It is the center for regulation of all of the learned movements that we have trained ourselves to perform, to the point that they become subconscious and second nature. When you first learn a new motor skill, such as how to walk, the encoding of that skill begins in the sensorimotor regions of the cerebral cortex. There, you consciously think about how to put one foot in front of the other and not lose your balance as you work to master this skill. After a lot of practice, the skill becomes second nature. The cerebral encoding diminishes and the new muscle memory, technically called implicit procedural memory, becomes encoded in the cerebellum. The cerebellum helps regulate our coordination of voluntary movement and fine-tunes these movements to make them smooth. When there is cerebellar pathology, walking, posture, the ability to vocalize, and skilled movements such as a golf swing, can be severely compromised. Figure 2. The Cerebellum (in red) lies posterior to the brainstem and inferior to the posterior aspect of the cerebrum. The limbic system (LS) participates in and modulates a variety of functions including memory, emotion, behavior, motivation, sense of smell, and the endocrine system. Your emotional life is largely housed in the limbic system, and it has a great influence over our formation of memories. The limbic system is a bit more complex than what we’ve discussed thus far. It’s composed of several different structures, and in some cases, there hasn’t always been universal agreement among neuroscientists about which structures should be included. The various types of components that make up the limbic system include nuclei (aggregations of neuronal cell bodies), white matter tracts (bundles of axons) and cerebral cortex. We will focus on some of the most critical portions relevant to memory and learning, but bear in mind that all the components of the limbic system likely play some role in these functions. The regions that we will focus on include the hippocampus, amygdala and prefrontal cortex. The latter is not included as a part of the limbic system by some experts, but this portion of the cerebrum is so intricately related from a functional standpoint to the limbic system that we’ll include it here as other experts do as well. Note, that like many of the structures of the brain, the limbic system has right and left sides, which results in pairs of each of the components. Figure 3. We’ll focus our attention on these three components of the limbic system. Other other components will not be included in our discussion. The hippocampus, named from the Greek word for seahorse due to its appearance and the fabulous imagination of early anatomists, is a pair of small subcortical structures at the inner (medial) aspect of the temporal lobes of the cerebral hemispheres. These small regions play a critical role in short-term memory, consolidation of long-term memory, and can be thought of as the immediate tape recorder of life’s events. There is some division of dutiesbetween the left and right hippocampus. When you need to remember a phone number long enough to dial it, you briefly store the number in your left hippocampus and adjacent temporal lobe cortex. The left hippocampus is the primary recorder of autobiographical and episodic memory (the story of your life). The right hippocampus and adjacent temporal lobe cortex are responsible for recording 3D spatial memory, such as how you just found your way into an office building, and to your intended destination. The hippocampi, despite their small size, are absolutely necessary if we are to have any ability for creating long-term memories. The most famous patient to have his hippocampi surgically removed, Henry Molaison, suffered total anterograde amnesia — he was only able to retain new memories for a very brief period of time. The amygdala are a pair of collections of nuclei named after the Latin word for almond. They are located in the inner aspect of the temporal lobes, just in front of the hippocampus. 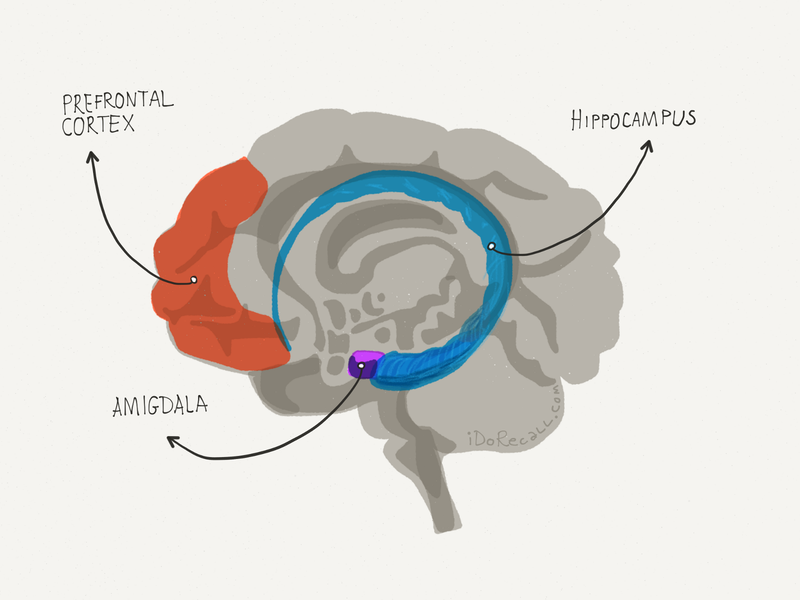 Each amygdala is directly connected, one synapse away, to its hippocampus. The amygdala is the seat of our emotions and is at the center of feelings such as fear, fight-or-flight, anger, rage and anxiety. Victims of PTSD (post-traumatic stress disorder) have enlarged amygdala as a result of their chronic stress condition. The reason why the amygdala is immediately adjacent and directly wired to the hippocampus is because, from a survival standpoint, we need to rapidly turn on our memory recorders and pay close attention when we perceive imminent danger and fear. We need to remember that saber-toothed tiger and its behavior in case we survive this moment, so that we can learn from the experience and avoid that danger the next time. The prefrontal cortex (PFC), as I mentioned, is in-part functionally a component of the limbic system. Our working memory (described in Part II) is stored in this region and is modulated by our emotions, rising up from the lower portions of the limbic system. The PFC is the seat of our personality. It is the center for what has been termed our “executive functions”. These functions include planning, goal-making, social behavior, judgment, “right vs. wrong”, evaluation of the consequences of our actions, decision-making and a lot more. Lesions of the PFC can lead to loss of concentration, inability to make judgments, personality alterations and a host of psychopathologies including various antisocial behaviors. We often call the everyday version of those pathologies “the teenage years”! It turns out that the myelination of the cerebrum occurs over many years, beginning in the back of the brain and working its way to the front. During our early- to mid-twenties, the myelination process of insulating our axons in the prefrontal lobes is completed. However, during the teenage years, before the prefrontal cortex is fully myelinated, our behavior is most at risk for being impulsive and irrational. This probably explains in part the propensity for drug use and other behavioral problems during those years. Let’s now dive down into the microscopic anatomy of the brain so that we have a firm basis for understanding what neuroscience has discovered about how we learn, create and access memories. The most fundamental unit of the brain on the cellular level is the neuron. There are over 100 billion neurons in the brain. Lay people often think of neurons as being most numerous in the grey matter of the cerebral hemispheres, but that is not the case. There are less than 20 billion neurons in the cerebral hemispheres and more than 100 billion neurons in the cerebellum. It appears that all of that muscle memory necessary for coordination and ingrained movement requires a lot of “hardware” to store all the related software and data related to muscle and procedural memory. Figure 4. Schematic depicting how one neuron communicates with another across synapses. Let’s take a moment now to review in more depth the basic physiology of synapses. Neural communication is predicated upon one neuron “talking” to another neuron across synapses and either stimulating or depressing the electrical function of the receiving neuron’s dendrite. The process of neural communication begins with the so-called firing of an action potential, an electrical signal that travels down the axon through a process of depolarization, and the passage of ions across the cell membrane of the axon. When this electrical wave arrives at the distal tip of the axon, or the axon terminal, it triggers the release of neurotransmitters that pass through the cell membrane and into the synaptic cleft. The synaptic cleft is the narrow space at the synapse between the axonal terminal and the receiving dendrite or cell body. These chemicals then rapidly diffuse over to the receiving dendrite and attach to receptors on the cell membrane of that dendrite. The attachment of the neurotransmitter on the receptor results in either an excitatory or inhibitory effect on the dendrite. If there is sufficient excitation, the dendrite may form its own depolarization, resulting in an electrical wave which heads towards that cell’s body. 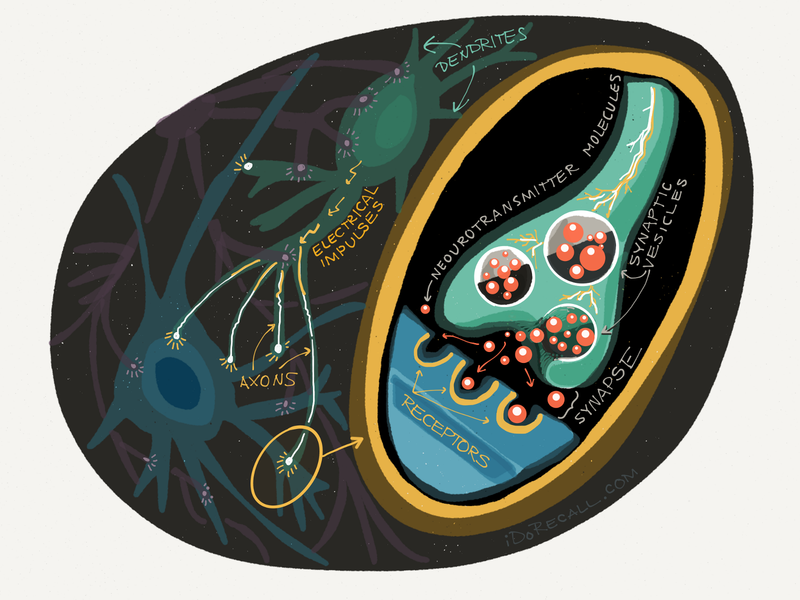 A neuron may have up to 10,000 synapses on its dendritic tree (and cell body). The sum total of signals of stimulation and depression coming into those dendrites, and any resultant depolarizations in the dendrites heading toward the associated cell body, determines whether that second neuron will send an action potential (electrical wave) down its own axon towards synapses with the next neurons further down the circuit. (See Figure 5) With over 100 billion neurons in the brain, which have an estimated average number of 7,000 synapses per neuron, we have over a quadrillion (1015) synapses. This extraordinarily complex neural network is a highly efficient data processing machine. Some estimates suggest that the human memory can store up to 2.5 petabytes of data. That’s equivalent to storing a 3 million hour-long HD YouTube video, which would take 300 years to watch! Figure 5. 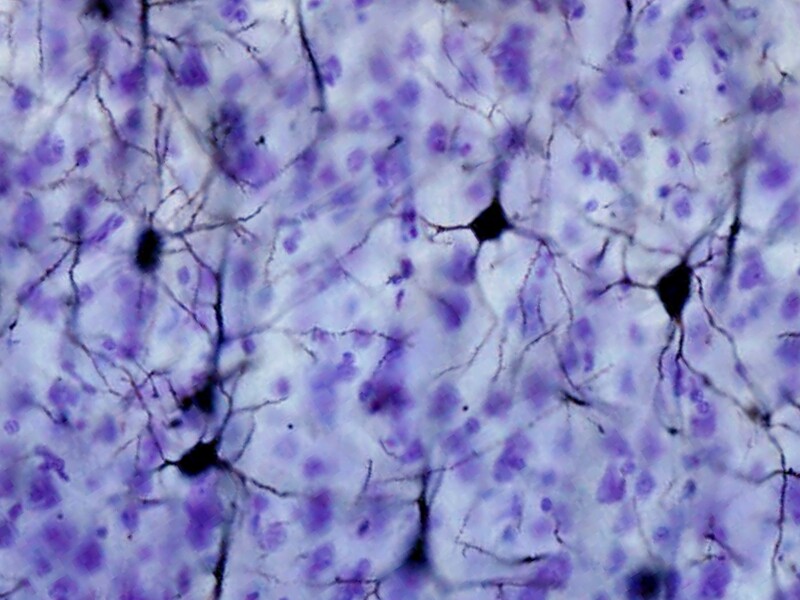 Microscopy of neurons connecting at synapses. Courtesy of brainmaps.org. Now that we’ve reviewed the fundamental knowledge of neuroscience necessary to understand how we learn and think, let’s move on to Part II of this series and discover the amazing advances we’ve made in our understanding of how our brain functions when we learn, and create and retrieve memories. Before we go, permit me to share a very funny story via YouTube. 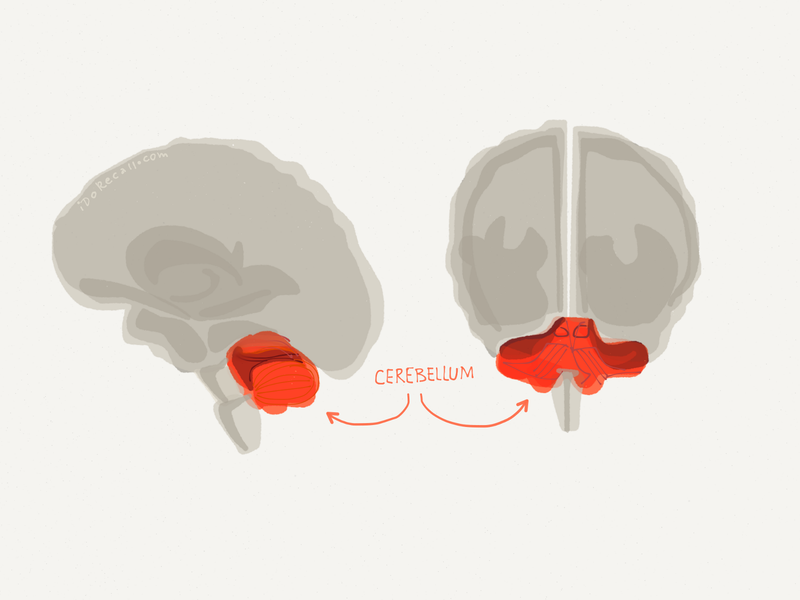 We discussed above how the cerebellum is the seat of what we call procedural or implicit memory. If we didn’t have this type of memory, performing everyday sensorimotor tasks such as walking, talking and playing sports would require so much conscious effort that those actions would become virtually impossible to perform. Once we’ve mastered these skills, made them subconscious and relegated them to the cerebellum, they can become extraordinarily difficult to unlearn. This hilarious video demonstrates the unbelievable challenge of trying to unlearn how to ride a bike. See you in Part II.